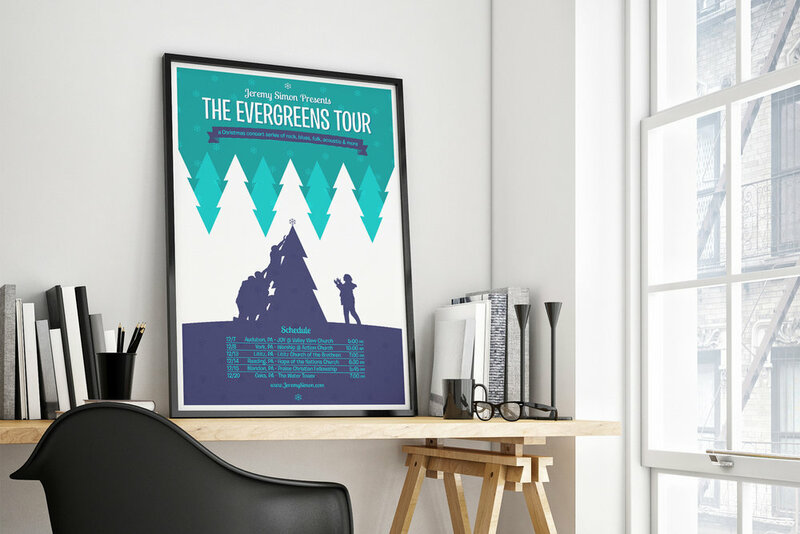 The Evergreens is a collection of friends and musicians who team up each year to perform seasonal soundtracks packed with classics to churchgoers and youth groups within their parochial circuit. This holiday tour poster was designed in collaboration with the band who pulled inspiration from a snapshot capturing their attempt at topping the Christmas tree. Lighthearted and carefree, the color palette and papercraft aesthetic extend a friendly invitation to welcome guests of all ages who enjoy celebrating this special time of year. The concert series is a perfect excuse to revisit this work in the future, designing a series of graphic souvenirs to commemorate the annual event and turn creative teamwork into a tradition worth looking forward to.